That said, this is the perfect coffee cake for the holidays. I made this last Thanksgiving for breakfast (you just have to go all out on Thanksgiving!) and my family loved it. 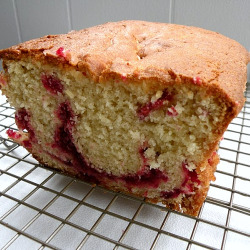 I am a big fan of fresh cranberries in baked goods and this cake had just the right amount layered throughout. The streusel topping was a nice finish and the toasted pecans added so much. 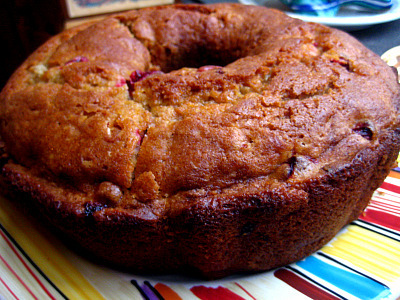 This Cranberry Coffee Cake would be a lovely treat anytime during the holiday season – take it to work, bring it to a friend or serve it for houseguests. I guarantee it will be a hit…just dont’ tell anyone about the three and a half sticks of butter. Preheat oven to 350 degrees. 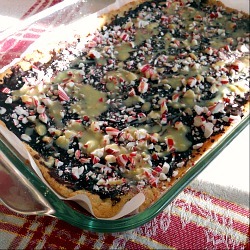 Coat a 9-inch square baking pan with nonstick spray. Line pan with parchment paper so it hangs over edges to create handles and spray again with cooking spray. 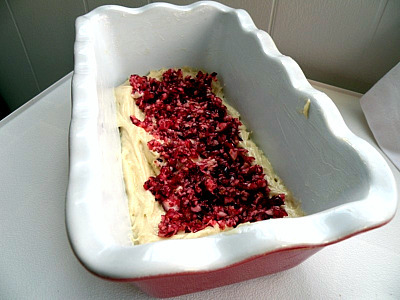 Melt butter and stir in flour, pecans, dried cranberries, sugar and orange zest. Set streusel aside. Pulse fresh cranberries, 3/4 cup sugar and orange zest in food processor and set aside. Whisk together flour, salt, cinnamon and baking powder in bowl and set aside. Whisk together eggs and egg yolk and set aside. Using hand mixer, cream butter and remaining 1 1/2 cups sugar in large bowl. Add flour mixture and egg mixture alternately to butter mixture, beating well after each addition. 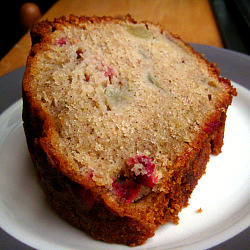 Transfer half of batter to prepared pan; top with cranberry mixture and then top with remaining batter, smoothing each layer. 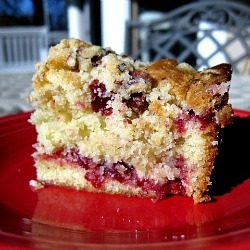 Use a knife to swirl batter and cranberries and top cake with streusel. Bake 55 to 70 minutes or until streusel is golden brown and toothpick comes out clean. Cool on wire rack for 20 minutes before serving. Greetings from Mema’s house! We arrived last night around 9 and were starving. Lucky for us, Mema had made cabbage rolls “deconstructed,” rice and green beans. So good and comforting – totally hit the spot. Finished dinner off with some ooey gooey bars (which I have had TOO many of while we’ve been here) and then fell into bed stuffed and exhausted. 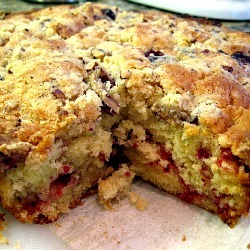 This morning we enjoyed some of this Pear Cranberry Cake for breakfast along with a fresh orange/grapefruit mixture. After breakfast, I headed upstairs to do a Dave Farmar power yoga podcast. I set up a space heater and felt right at home with my yoga practice! After yoga I was ready for lunch. I whipped up a potato/veggie/turkey kilebasa soup that Mema wanted to try while she made some pimento cheese. The soup was perfect for the rainy, cool day and Mema’s pimento cheese is always a hit! Of course I had to finish it off with another ooey gooey bar. After a lazy afternoon of getting Mema’s Christmas Nook set up and playing Scrabble, Brandon and I picked up a Mellow Mushroom pizza for dinner. Mellow Mushroom was our favorite pizza in college but they don’t have one in Charlotte. It was a yummy treat. They have the BEST dough! Mema had a piece of the Pear Cranberry Cake for dessert. Overall I was pleased with it but I definitely thought it could have used more cranberries. The cranberry to pear ratio didn’t seem quite right. Also, the original recipe calls for a glaze but since we were traveling with the cake, I left it off. Good thing I did because Mema says she much prefers cakes without glazes. I thought the pears were a nice change of pace from your traditional apple cake. We’re heading home tomorrow. I’m hoping to get a nice run in and attack some leftovers from the weekend before we leave! Preheat oven to 350 degrees. Butter a bundt or angel food cake pan. Whisk together flour, baking powder, salt and spices and set aside. In the bowl of a stand mixer fitted with the paddle attachment or using a hand mixer, beat together sugar, oil, eggs and vanilla on medium high speed until well combined. Reduce speed to low and mix in pears and cranberries. Once combined, slowly mix in flour mixture until all flour has been incorporated. Pour batter into prepared pan and bake until a wooden pick inserted into center of cake comes out clean, 1 1/4 to 1 1/2 hours. Cool in pan 30 minutes and then turn out onto a rack to cool completely. Bring cream, brown sugar, corn syrup, vanilla, cinnamon sticks and a pinch of salt to a boil in a small heavy saucepan, stirring occasionally, then simmer until slightly thickened, about 10 minutes. Cool glaze 5 minutes. Discard cinnamon sticks, then pour glaze over cake, letting some drip down sides. 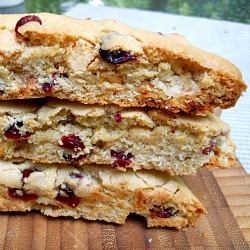 This biscotti was the second item in my Operation Baking Gals holiday package. 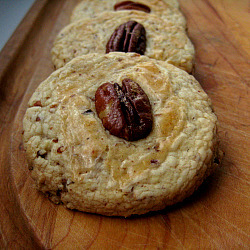 I blogged about Operation Baking Gals and the Pecan Sables I made in my last post. 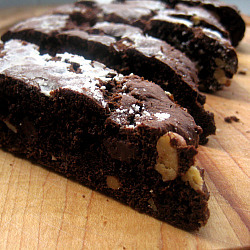 I thought that biscotti would be the perfect thing to make since it’s pretty sturdy and has a longer shelf life than a drop cookie. 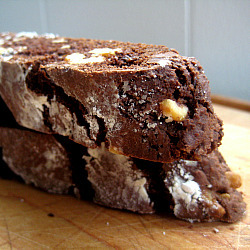 I decided on the Double Chocolate Walnut Biscotti after seeing it in The Gourmet Cookbook. I looked the recipe up online and saw that it was originally printed in 1994 and had received around 250 positive reviews. That sealed the deal on making this recipe. 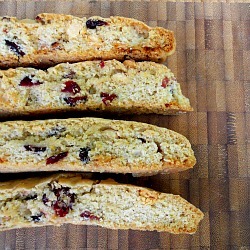 Despite the double baking, biscotti is pretty simple to make. I love the thick dough and the process of the initial bake and then slicing and baking again. It’s fun to see the actual biscotti take shape! I didn’t sample the biscotti but Brandon and my grandmother did (I sent her a package of extras). I know I’ve mentioned this before but super chocolaty desserts just aren’t my thing. They both ate it for breakfast and said it was great – the chocolate flavor is definitely the star here. This would also be a nice snack or dessert anytime of the day! Preheat oven to 350 degrees. Butter and flour a large baking sheet. In a bowl whisk together flour, cocoa powder, baking soda and salt. In the bowl of a stand mixer fitted with paddle attachment or in a large bowl using an electric mixer, beat together butter and granulated sugar until light and fluffy, about 3 minutes. Add eggs one at a time and beat until well combined. Stir in flour mixture until a stiff dough. Stir in walnuts and chocolate chips. With floured hands form dough into two slightly flattened logs on the prepared baking sheet. Each log should be about 12 inches long and 2 inches wide. Sprinkle with powdered sugar. Bake 35 minutes or until slightly firm to the touch. Cool on baking sheet 5 minutes, leaving oven on. On a cutting board, cut logs diagonally into 3/4-inch slices to form biscotti. Arrange cut sides down on baking sheet and bake until crisp, about 10 minutes. Cool completely on a wire rack. Biscotti keep in airtight containers 1 week and frozen, 1 month. I made these cookies as part of my holiday package for Operation Baking Gals. This is an organization that I’ve been participating in since the last holiday season. Check out what I baked for the other rounds here and here. Rather than me try to explain the organization, I’ll just give you a blurb from their Web site. Basically, the way is works is that someone (usually a blogger) forms a team to host a soldier. Then they recruit people to join their team and bake. 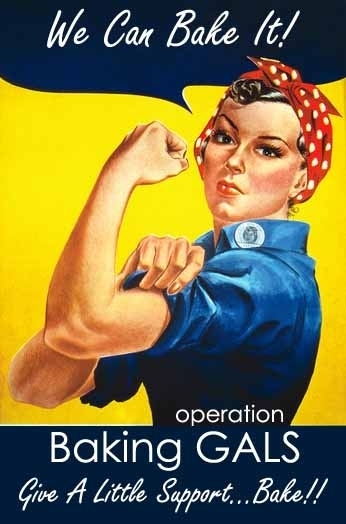 I’m so excited to report that there were 47 teams for this round of Operation Baking Gals. That’s seriously amazing! I joined Team Beantown Baker – hosted by fellow blogger, Jen. Check her awesome blog out here. I decided to go with sturdier cookies for this round. I browsed through The Gourmet Cookbook and looked for recipes that said the cookies would keep for 5 days plus. 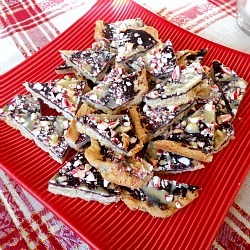 Pecan Sables sounded nice and holiday-ish and I also picked Double Chocolate Walnut Biscotti. You’ll have to wait until tomorrow for that recipe! The Pecan Sables were crisp and had a lovely balance between salty and sweet. The ground pecans in the cookie batter provided a nice nutty flavor. These are simple and delicious. I tried a new packing method for this round. I wrapped the cookies in sets of two in cling wrap, then placed them in sandwich bags and then layered the sandwich bags in plastic containers. I have high hopes that they will arrive in tact and fresh tasting! I was dreading the trip to the post office today to send off my package. I was shocked to discover that the post office was rocking – they had a system down and were fully staffed. It was a great experience. Once I got through the hustle of getting in and packing up the cookies in the APO flat rate box, I found myself waiting in line fighting back tears. It was such a juxtaposition that I was standing in the post office in the holiday hustle and bustle while Rebecca is serving our country and spending her holidays in Iraq. I will be hosting an Operation Baking Gals team in 2010. One our friends is being called back into active duty to go to Afghanistan. I encourage you to participate with me. I will share the details when I have them. I will also be helping fellow blogger Tracy with a round in 2010. 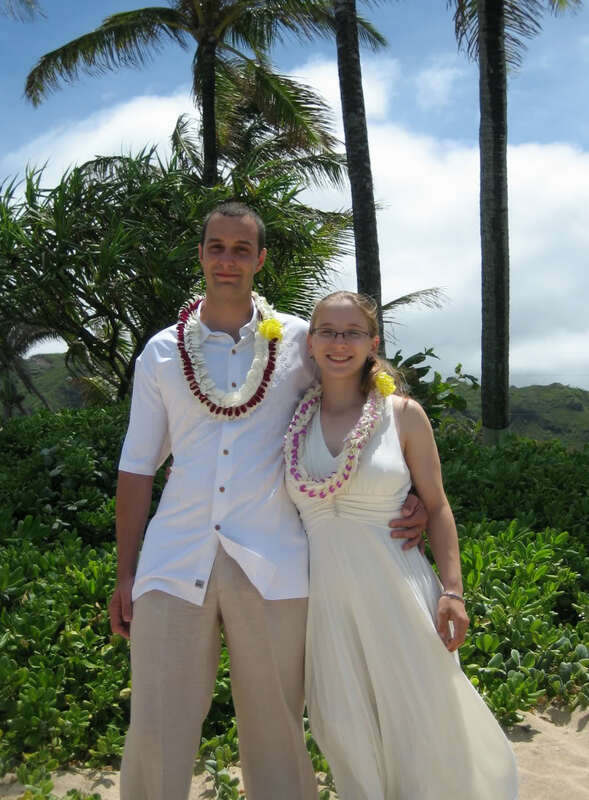 Her brother is currently serving in Afghanistan as well. Preheat oven to 325 degrees. Butter 2 large baking sheets. In a food processor, pulse toasted pecans with 2 tablespoons confectioners sugar until finely ground. In a separate bowl, whisk together flour, salt, and baking powder. In the bowl of a stand mixer fitted with the paddle attachment or using a hand mixer, beat together butter, remaining 2/3 cup confectioners sugar and vanilla on high speed until fluffy and lightened in color. This should take about 3 minutes. Add egg yolk and beat well to incorporate. Slowly add flour and pecan mixture on low speed and mix until just combined, about 1 minutes. Dough should be crumbly but hold together when squeezed. Halve dough and roll out half between 2 sheets of wax paper until 1/4 inch thick, about a 9-inch round. Using a 2-inch cookie cutter, cut out as many rounds as possible. Arrange 2 inches apart on baking sheets, reserving scraps. Roll out and cut remaining dough in same manner. Gather scraps, then re-roll and cut again. Beat egg white until frothy and brush tops of cookies lightly. Place a pecan half on top of each round and brush pecan lightly with egg white. Bake cookies for about 15 to 20 minutes, until tops are lightly golden. Cool cookies on sheets on racks 2 minutes, then transfer to racks to cool completely. I came across this recipe while flipping through the Breakfast/Brunch section of The Gourmet Cookbook. I thought it would be perfect to have on hand during the holidays, as a breakfast treat or an afternoon snack. Brandon and I decided that this bread is definitely less coffee cake and more pound cake. 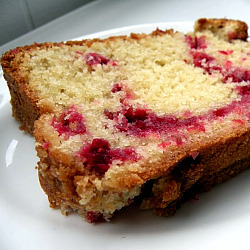 The flavor of the cake itself was extremely reminiscent of pound cake. The fresh cranberry ripple added a nice touch of fruit flavor. 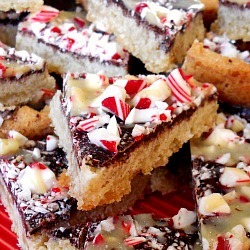 This would be perfect to have around the house for guests to snack on or as part of a holiday breakfast or brunch. I sliced and wrapped the bread in individual slices and put them in the freezer for a quick (and indulgent) snack on the go. Preheat oven to 350 degrees. Generously butter a 9 x 5 loaf pan. Place cranberries and 1/2 cup of sugar in food processor and pulse until cranberries are finely chopped and sugar is incorporated, careful not to puree. Place in a sieve and let drain while you prepare the cake batter. In a medium bowl, sift together flour, baking powder and salt. Set aside. In the bowl of a stand mixer or in a large bowl with a hand held mixer, cream together butter and remaining 1 1/3 cup sugar for about 3 minutes on high speed until light and fluffy. Reduce mixer speed to medium and add in eggs one at a time, mixing well after each addition. Add in vanilla. Reduce speed to low and alternately add flour mixture and milk in three parts, beginning and ending with flour. Spread 1/3 of the batter in bottom of prepared loaf pan. Spoon 1/2 of the cranberries over the batter, leaving a 1/2 inch border around the edges (see picture below). Top with another 1/3 of batter and remaining cranberries and finally, top with last 1/3 of batter. Bake for 50-60 minutes, until a toothpick inserted in center comes out clean.